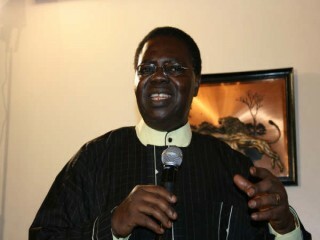 Ebenezer Obey (born 1942), nicknamed the "Chief Commander," is a Nigerian pop musician. While Nigerian musician Chief Commander Ebenezer Obey did not create the juju style of music, he has nonetheless been a seminal force in reinventing what has come to be known as Nigeria's national sound. Taking the reigns from juju master I. K. Dairo, Obey further modernized the music with his miliki (pleasure or enjoyment) style, adding several "talking drums" at once and incorporating Yoruban drumming and Western guitars. In a musical career spanning half a century, Obey's work has often been compared to that of fellow juju musician King Sunny Adé, with whom he has shared a friendly 40-year rivalry. Born Ebenezer Remilekun Fabiyi in 1942 in Nigeria, Obey's formal musical activity began early, when the music performed at his church's Sunday School prompted him to join the choir and later to lead the Methodist Primary School band. He earned his English nickname as a student monitor, while telling fellow pupils to "obey." While Western sources generally give Obey's birthplace as Idogo, Abeokuta, in what would later be called Ogun State, Nigeria Arts wrote that he was born at Island Maternity Hospital in Lagos, Nigeria's capital, and raised in the Fabiyi family's hometown of Idogo. He left his village in the 1950s, halfway through grammar school, and moved to Lagos, where he played the guitar and thumb piano in several bands, including the Royal Mambo Orchestra, the Guinea Mambo Orchestra, the Fatai Rolling Dollar, and the Federal Rhythm Brothers. After finishing his secondary education in Abeokuta and moving back to Lagos in 1963, Obey juggled his work as a clerk with that of musician, composing songs in his spare time. In 1964 he formed a group called the International Brothers. The band, known for its Yoruban percussion, vocals, and layered guitar sounds, soon gained notoriety with its hit juju song "Ewa Wowun Ojumi Ri." In 1971 he renamed the band InterReformers '70. By the 1960s juju had been around for several decades. With its origins in Yoruban folklore, however, it remained a rural music eclipsed by Ghanian highlife as Nigerians' choice for party music. However, the music's modernization at the hands of I. K. Dairo and its growing importance during the Nigerian civil war would, by 1970, secure juju's status as Nigeria's national music. Whereas Dairo and other juju artists performed many songs dealing with women and their beauty, Obey's lyrics (sung in a voice described as both sweet and velvety) were more religious. A devout Christian like both of his parents, he composed songs dealing with issues of honesty, morality, love, family, peace and other themes associated with his faith. "My music teaches a lot of morals and educates people," he told the Orange County Register. "For instance, when the government does something good, I always try to support it, because I can reach many Nigerians through my records, to help them see the point in what the government is trying to say." In the area of music, Obey was anything but traditional. Where Dairo had altered juju with the introduction of the Yoruban talking drum and the accordion, Obey introduced a series of changes that would come to be branded as his miliki style of juju. These changes, which included several talking drums, multiple guitars, electric bass and a simplified, upbeat tempo, have led many to regard Obey as the father of modern juju. "I decided to modernize juju music, and I added more talking drums, more guitars and so on," he told the Los Angeles Times. "It makes the music very heavy, and it catches the ears of the listeners. That's why they are not fed up with listening to the records of juju music---even though I release three records a year." While Obey would surpass Dairo in popularity by the end of the 1970s, he had another challenger in King Sunny Adé, who burst onto the juju scene in 1966. Obey and Adé challenged each other musically, advancing the evolution of juju music in a reportedly friendly competition that lasted for decades. "The competition between Obey and KSA, as Nigerians know Adé, engaged the public and fueled rapid evolution of the juju sound as trap drums, pedal steel guitar, synthesizers, and more and more percussion instruments joined the lineup," wrote Afropop Worldwide. "By the time KSA first toured internationally in the early `80s, juju could compete with that era's best rock music for its force of expression, theatricality and visceral impact." Unlike Adé's "synthed up Americanized" juju, "Obey's brand of juju is simultaneously complex and elemental, and more traditional," declared the Washington Post. "The talking drums establish a propulsive rhythm pattern, Obey's guitar lays another jittery rhythm over that, chanted harmonies join in, and so on with the rest of the 17-piece ensemble. The result is a colorful, thickly interwoven texture that somehow sounds airy, and reveals new details each time you hear it." Despite his legendary status in Nigeria, where he has sold millions of records and has been known to give concerts lasting up to nine hours, not all Westerners have been enamored of his performance style. "Unlike his fellow countryman King Sunny Adé, Obey is not a natural performer and functions more as benign patriarch a la blues great Muddy Waters," wrote a critic for the Los Angeles Times. The critic praised Obey's blues/rock solos but noted his "lack of charisma" and made the observation that he "never seemed comfortable until he stepped back from the microphone to blend in with his 13-piece Inter-Reformers Band, leaving the group's three singer-dancers to work the audience." Although he beat Adé to the international market, Obey has not achieved the commercial success of his competitor. Largely a Nigerian phenomenon with dozens of recordings to his name and advance album sales topping 100,000 copies, Obey first reached out to international audiences with the album Current Affairs in 1980. Three years later he tried the market with Je Ka Jo, an album that incorporated both highlife and funk. Despite several international album releases and an acclaimed tour of the United States with a pared down ensemble in the 1980s, Obey still had difficulty selling his records. Without the promotional resources of Adé, his international audience remained largely confined to Nigerian expatriates. Over the course of his career, Obey has recorded close to 100 records, including some 50 LPs and his numerous singles, CDs and seven-minutes EPs. Obey is currently an evangelist and gospel musician, and owns a cassette manufacturing company in Ogun State.